Front: Keegan Tom, Simon Miller, Toby Harges, Zachary Mehlberg, Addison Mehlberg, Drake Chilafoe and Thad Harges. Second row: Thomas Coulter, Cade Williams, Kelsey Nethercutt, Madison Johnson and Mr. Lee Snider, principal. Third row: Eileen Ransbottom, Alex Ransbottom, Mason Johnson, Ivory Snipes of Echoes of the Past, Scott Mehlberg, Dave Mehlberg, Dan Ransbottom and Adam Heckaman, president of Echoes of the Past. 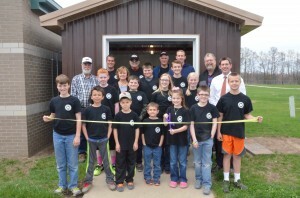 Wednesday students, staff, parents and members of the community gathered to celebrate the construction of Harrison Elementary’s newest building –a clubhouse for the Harrison Elementary Garden Tractor Club. The 12×20 foot, heated and insulated structure is a huge boon to the club, which began during the fall in the school’s mechanical building. According to club leader Scott Mehlberg, he and the 11 students involved in the Garden Tractor Club would meet once a week from 4 p.m. to 5:30 p.m. on Wednesdays. The club would first have to clear equipment out of the unheated, uninsulated mechanical building before being able to start work on the club’s projects. Now, the students will have a heated and insulated building where they can work year round. The students’ dreams of having their own space to work would not have been possible had it not have been through the generous donations of several donors. According to Mehlberg, the building itself was donated by Dan and Eileen Ransbottom of Ransbottom Excavating in Claypool, whose granddaughter is in the club, and monetary donations for the project were provided by Echoes of the Past. In addition, Mehlberg noted that David Rice from Crawfordsville provided the tractor that the children in the club have been working on. Monetary donations were also raised through an online forum from donors from locations as far as England. 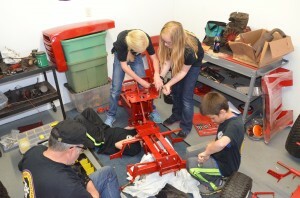 Students work on assembling the tractor they will sell to a bidder in June. Harrison Elementary School Principal Lee Snider noted the donations parallel to Warsaw Community School Corporations mission statement. Snider noted that like WCS’s goal to utilize one’s own skills and talents to enrich the lives of others, both Mehlberg and Ransbottom, as well as the donors involved with the club, have worked to donate their skills, knowledge, time and financial support to the students to enrich their lives. “The kids are very excited about the project and the sense of belonging to this building, this club and the school,” stated Snider. The club will be holding an auction for the completed wheel-horse tractor in June. Mehlberg encouraged those interested in making a bid on the tractor to mail a bid to Scott Mehlberg at 1300 Husky Trail, Warsaw, IN 46582. Students in the club will be included in the bid process. All bids must be submitted to Mehlberg by 12 p.m. Thursday, June 5. For questions on the Garden Tractor Club or to make a donation, you may call Mehlberg at 574-269-7533.